Many Of Our Talk Radio Favorites Are Well Paid Advertisers And Promoters Of Various Political Organizations And Candidates, Whether Out In The Open Or Covertly! If you’re a regular listener of Glenn Beck’s radio show and you wanted to contribute to a political group that would advance the populist conservative ideals he touts on his show, you’d have plenty of reason to think that FreedomWorks was your best investment. But if you’re a fan of Mark Levin’s radio show, you’d have just as much cause to believe that Americans for Prosperity, a FreedomWorks rival, was the most effective conservative advocacy group. And, if Rush Limbaugh or Sean Hannity are who you listen to, you’d be hearing a steady stream of entreaties to support the important work of the Heritage Foundation. That’s not coincidence. 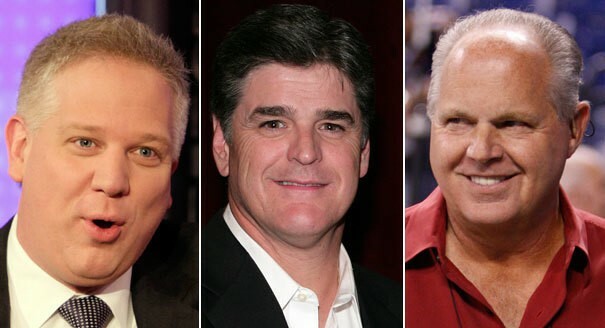 In search of donations and influence, the three prominent conservative groups are paying hefty sponsorship fees to the popular talk show hosts. Those fees buy them a variety of promotional tie-ins, as well as regular on-air plugs – praising or sometimes defending the groups, while urging listeners to donate – often woven seamlessly into programming in ways that do not seem like paid advertising. The Heritage Foundation pays about $2 million to sponsor Limbaugh’s show and about $1.3 million to do the same with Hannity’s – and considers it money well spent. Last month, in the midst of a flurry of scrutiny of GOP presidential candidates’ stances on health insurance mandates similar to one included in the 2010 Democratic healthcare overhaul, Limbaugh took to the airwaves to defend Heritage’s past support for such a proposal. Levin, whose endorsement deal with the tea party organizing group Americans for Prosperity started last summer, was similarly protective of his sponsor last year after President Barack Obama singled out the group in making the case that anonymously funded attack ads were distorting the midterm elections. “Americans for Prosperity is a magnificent organization that people join voluntarily. You. Me,” Levin said on his syndicated radio show. Obama, Levin continued, “wants you to hate Americans for Prosperity. So if he wants you to hate it, then you should embrace it, and promote it, and support it and join it, because it’s effective. Notes: Search out any and all of the above and everything else! Identify anything and everything to do with all personalities and organizations! Follow the money trails and every connection that you can in the search of the real truth! Don’t take anything for granted!